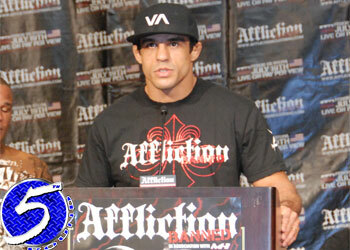 Some might have missed it, however Affliction Entertainment’s VP Tom Atencio certainly didn’t. During a commercial break in this past Saturday’s “TUF 9 Finale,” UFC president Dana White publicly stated that he is intending to make a run at former UFC champ Vitor Belfort. The only problem is he’s still under contract with Affliction with a fight right around the corner.